Myawady Sayadaw, a crimson-robed monk whose eyes dance behind round spectacles, casts himself as a genial warrior in Myanmar’s long struggle against military rule. Inside his monastery stands a tall stone monument to students killed in pro-democracy protests. In 2007, he and tens of thousands of monks marched peacefully in streets nationwide, staring down columns of soldiers in what was dubbed the Saffron Revolution. Today, with the military having yielded some powers to an elected government, Myawady Sayadaw peppers his sermons with references to human rights and interfaith understanding. But when it comes to Myanmar’s most explosive political issue — the army-led purging of Rohingya Muslims — the outspoken monk becomes taciturn. “Buddha loves all people and teaches us to try to resolve suffering, but we have a duty to protect our country at the same time,” he said at his simple monastery outside the northern city of Mandalay. In Myanmar, formerly known as Burma, hatred for the Rohingya runs far deeper than the fears over Islamist terrorism that the army has used to justify a ruthless, four-month crackdown in the western state of Rakhine. Soldiers have killed, raped or maimed thousands of Rohingya, according to international human rights groups, and more than 640,000 have fled across the border to refugee camps in Bangladesh. The antipathy toward the small Muslim minority — in a country that is 90% Buddhist — is a virulent brew of ethnic, economic and religious nationalism promulgated for decades by the military, and spread easily via social media across a population with some of the lowest education levels in Southeast Asia. 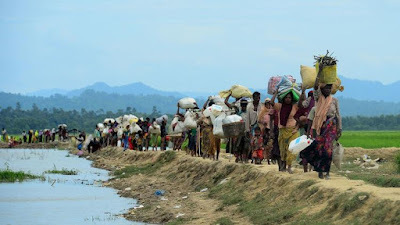 It is built fundamentally on racial differences: The Rohingya, who are denied citizenship in Myanmar, are physically and culturally more similar to the peoples of Bangladesh and India than to Myanmar’s ethnic Bamar majority. Scholars say they descend from Arab and Persian traders who arrived in what is now western Myanmar more than 1,000 years ago. Those differences have driven a deep wedge through this country of 50 million. Of all the monks, student activists, ethnic guerrillas and other dissidents who once opposed the army’s abuses, almost none have spoken up for the country’s most beleaguered people. “All these democratic activists, when they talk about human rights and citizens’ rights, they have a prejudice — the Rohingya are not included,” said Thet Swe Win, director of the Center for Youth and Social Harmony, a Myanmar nonprofit. For years, Myanmar’s army has rallied Buddhists by claiming a Muslim plot to overtake the country. 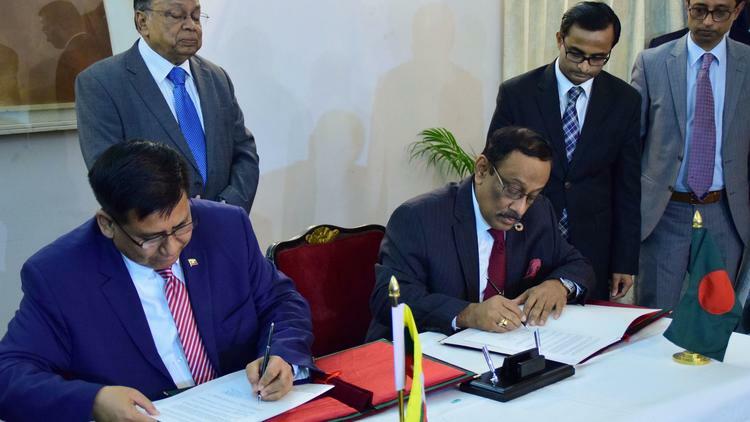 It rewrote the country’s arcane citizenship laws to exclude the Rohingya, and routinely ignored hardline monks who spewed hatred toward Muslims. The propaganda was seemingly confirmed after a small insurgent group — the Arakan Rohingya Salvation Army, or ARSA — rose up last year and began attacking Myanmar security forces. 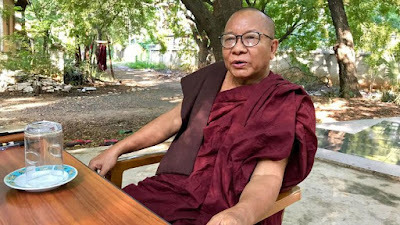 Now monks such as Myawady Sayadaw freely reconcile Buddha’s nonviolent teachings with a military offensive that some call a possible genocide. “Once ARSA emerged, it allowed even pro-peace, pro-interfaith people in the country to write off the Rohingya as a terrorist threat, no matter how implausible that is,” said Matthew Walton, a professor and Myanmar expert at the University of Oxford. There was little outcry in October after one of the country’s most influential monks, Sitagu Sayadaw, gave a speech at a military base in which he appeared to justify ethnic cleansing. He invoked a parable about an ancient Sri Lankan king who was advised not to grieve for the many Hindus he killed in battle because non-Buddhists were not human beings. Myawady Sayadaw said his fellow clergyman’s words were “dangerous.” But in the next breath he accused the international media of exaggerating the violence against the Rohingya. Aung San Suu Kyi, the Nobel Peace Prize winner who spent years under house arrest and now heads the civilian government, has been pilloried internationally for defending the military, but remains Myanmar’s most popular politician. Of the dozens of ethnic minority groups that long battled the army for greater rights, only one — a women’s organization representing ethnic Karen, many of whom are Christians — has issued a statement condemning the military’s campaign against the Rohingya. As one of the few Myanmar activists to champion the Rohingya cause, Thet Swe Win, 31, has come under attack on social media. Nationalist groups have labeled him “a maggot” and accused him of taking bribes from Muslim countries. His mother said she couldn’t support his work. Friends have deserted him. When the army took power in 1962, it began pushing the narrative that the Rohingya had been brought into Myanmar illegally by British colonial rulers, who used laborers from present-day India and Bangladesh to build roads and infrastructure. The generals created an educational system that inculcated bigotry in generations of schoolchildren. One Rohingya, Wakar Uddin, remembers such lessons from his days as a sixth-grader in Rakhine in the late 1960s. His class read a story that described Indians as filthy street-sweepers with monstrous features; Uddin recalled liberal use of the slur kalar — used to describe dark-skinned people — and that when the teacher read from the book, Buddhist students laughed and applauded. 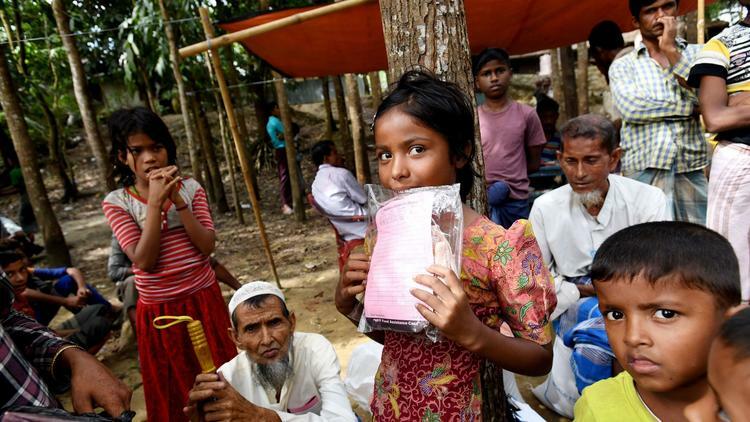 “That book was poison,” said Uddin, a biology professor at Penn State who directs the Arakan Rohingya Union, an advocacy group. “Over 50 or 60 years, the army provided fertile ground for hate, and putting that into the mind of a third- or fourth-grader brings you the results we are seeing today,” he said. Even as the Myanmar government and Bangladesh pursue a plan to repatriate Rohingya refugees starting in January, the state-supported climate of hate makes it all but impossible to imagine that many could return. Public officials can say just about anything about Rohingya without fear of it diminishing their stature. In 2009, Myanmar’s consul general in Hong Kong wrote a letter to foreign diplomats calling the Rohingya “ugly as ogres” with “dark brown skin.” (By contrast, he said, his own skin was “fair and soft … and good looking as well.”) The remark did not hurt his career; the military government later appointed him ambassador to Switzerland.